Water is the subject of much discussion these days. We have finally been made to realise just what a precious commodity it is, and we are paying a price for our previous profligacy. Too high a price, I think. Whilst I understand that it must be treated as a limited resource, I object to the multiple layers of government and therefore public servants that have been created to do the managing. We now have argy-bargy between local and state governments about the cost of water, and a new scapegoat "Urban Utilites" whose job it is to be blamed by everyone else. As it happens, I just opened my "Urban Utilities" water bill today, and I may not shower for the next week or two. After all, it is nearly winter. Brisbane gets its water from all over the place. There are multiple dams linked into the water grid, and engineers can control the flow from each one. If we go back to drought conditions, we can summon up desalinated water or recycled water to add into the mix. 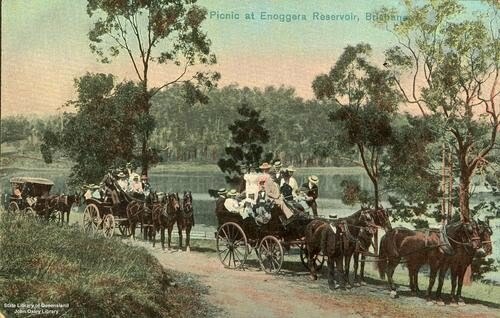 Brisbane's (in fact Queensland's) first major dam is the Enoggera Dam, about ten kilometres from the CBD in the suburb of The Gap. This dam was commenced in 1864 and finished in 1866, and was built to replace the previous water supply that emanated from Wheat Creek in the city. 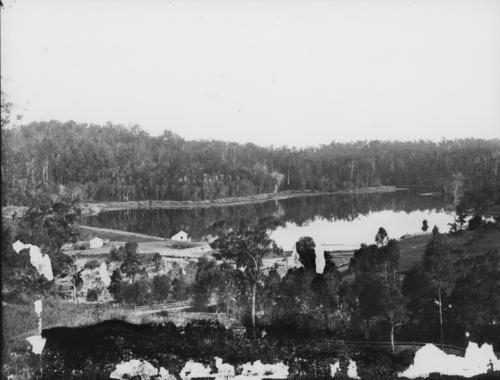 Here is a photograph of the Enoggera Dam from around 1888. 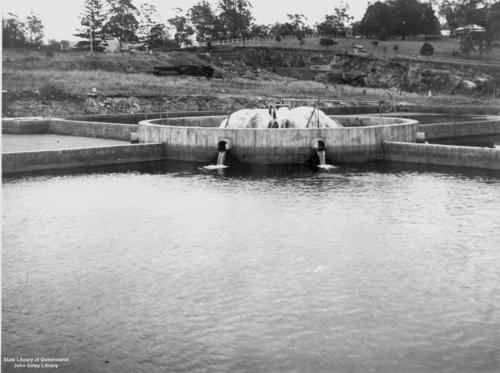 After the dam was finished, a couple of service reservoirs were built on Wickham Terrace to hold water for Brisbane residences. The dam's engineer, Joseph Brady, designed a very efficient dam that had three outlet pipes to draw water, rather than the usual single or dual pipe systems. This photograph is from 1912. The dam gathers water from Enoggera Creek, a tributary of the Brisbane River, and is set amongst bushland in what is now Brisbane Forest Park. Being relatively close to the city, it has long been a favourite spot for a walk or a picnic. These folks were heading for a picnic at the reservoir back in 1900. After the construction of the Wivenhoe Dam, which was not only meant to supply enough water to last South-East Queensland until eternity, but also prevent flooding in the area (neither aim has been achieved! ), the Enoggera Dam was decommissioned in 2003. But the ensuing drought saw the infrastructure being brought back into service, and I dare say that it might be operating for a few years yet. Here is a recent picture.